The Great Fire of 1892 destroyed over half of the city of St. John's, and left approximately 11,000 people homeless. Despite the extensive damage, the city was quickly rebuilt. Some buildings, or at least their shells, survived and were rebuilt, especially those of stone and brick construction. Many of the city's residential properties, however, were made of wood and were destroyed. They too were rebuilt quickly, and the burned-over area came to have a distinct and recognizable architectural style. Most of these buildings were built in a variant of the Second Empire style, introduced to St. John's in the early 1880s by John Thomas Southcott. He was the son of James Thomas Southcott, who arrived in St. John's in the wake of the 1846 fire with his brother John. Their firm of J. & J. T. Southcott was responsible for many buildings and houses in St. John's before the fire. But it was the work of John Thomas Southcott after the fire that is most notable. He studied architecture in England and brought the Second Empire style to St. John's on his return around 1877, and many of the homes rebuilt after the 1892 fire, whether designed by Southcott or not, contained Second Empire design elements. This style was so widely associated with the Southcott firm that it became known locally as the “Southcott Style.” Its distinguishing features are hooded dormer windows, ground floor bay windows and especially the mansard roof. 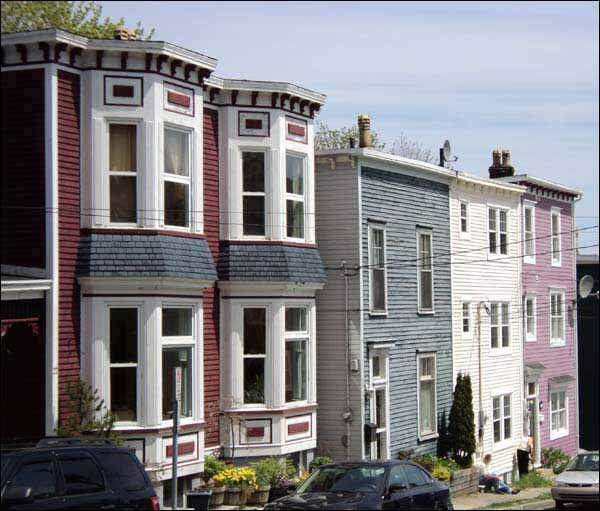 The Southcott style became the dominant architectural style in St. John's in the aftermath of the 1892 Great Fire, and to a certain extant it is even possible to discern the boundaries of the fire by the presence of this style in the downtown. This view of homes on Cochrane Street shows how many of the houses built after the Great Fire of 1892 were in the Southcott or Second Empire style. The mansard roof and hooded dormer windows are clearly evident in this row of houses. Photo by Keith Collier. ©2011, Newfoundland and Labrador Heritage Web Site. Examples are common, such as former mayor Andrew Carnell's home at 28 Cochrane Street. In fact many of the homes in the area rebuilt after the 1892 fire (which comprises much of the downtown area) are notably Southcott-influenced. Gower and Bond Streets and most streets running both parallel and perpendicular to them have many Southcott streetscapes. Another good example is the S. O. Steele Building at 100 Water Street. Built in 1894, its hooded dormer windows and mansard roof are classic Southcott style. These homes on Gower Street near British Square are also classic Southcott or Second Empire designs, with mansard roofs and hooded dormer windows. Note the decorative window and door openings. While the Southcott style dominated the immediate post-fire period, the Queen Anne Revival style also became common in the early decades of the 20th century. This style was characterized by turrets, gables, large bay windows and decorative touches that give Queen Anne homes a somewhat “grand” appearance. Examples include Waterford Manor, Bartra, and Winterholme. While many homes in St. John's built in the early 1900s feature Queen Anne Revival designs, this style was mainly used for large, exclusive homes. There were, of course, many simpler homes designed and built in the years after the Great Fire. Common features included flat roofs (quick and easy to build) with some decorative additions, usually roof brackets and sometimes dentils. 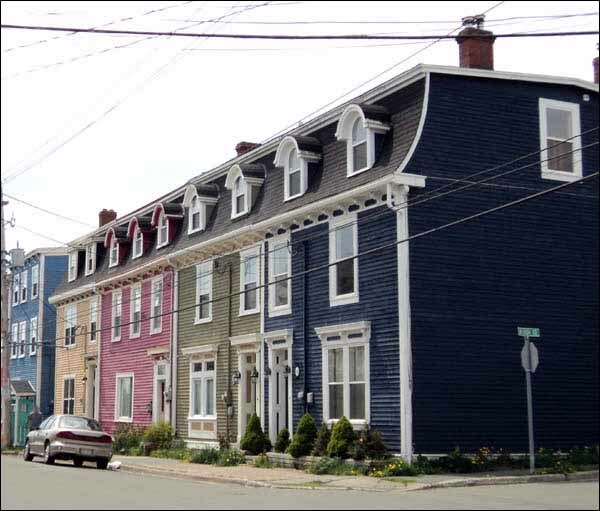 This style was quite common in St. John's, as well as the outports, well into the 20th century, and many houses (especially row or attached houses) have flat or mansard roofs. The bungalow, introduced in the early decades of the 1900s, became popular towards the middle of the century. 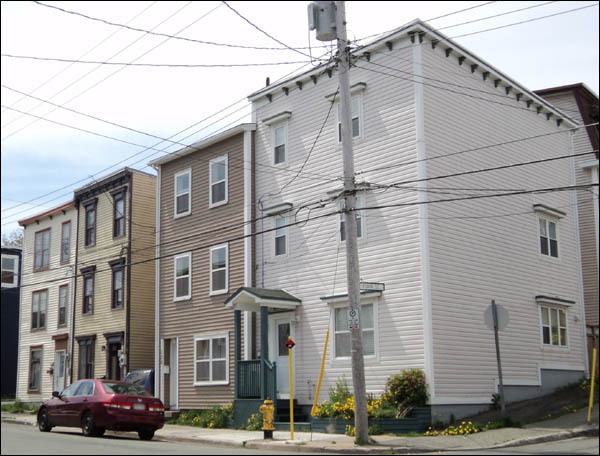 These Wood Street houses are good examples of the varieties of Southcott-inspired design that exist in St. John's. One of the major priorities in the reconstruction after the Great Fire of 1892 was to rebuild the many commercial and ecclesiastical buildings that had been destroyed. Some buildings were reconstructed on their old foundations or rebuilt in their burnt-out shells. The Baird building on Water Street is a good example of post-fire rebuilding. While the exterior walls remained standing, the interior had to be rebuilt, and the exterior was modified in appearance while retaining much of its old design. Some buildings, such as the Customs House and the Athenaeum, were never rebuilt. Still others were new constructions entirely. The Masonic Temple on Cathedral Street was built in 1894 to replace the old wooden Masonic Lodge on Long's Hill that was destroyed in the fire. Inspired by the classic English lodges that were popular at the time, the Masonic Lodge incorporated classic design elements such as pillars and pediments, in contrast to the Gothic style that was common in St. John's, especially in churches. 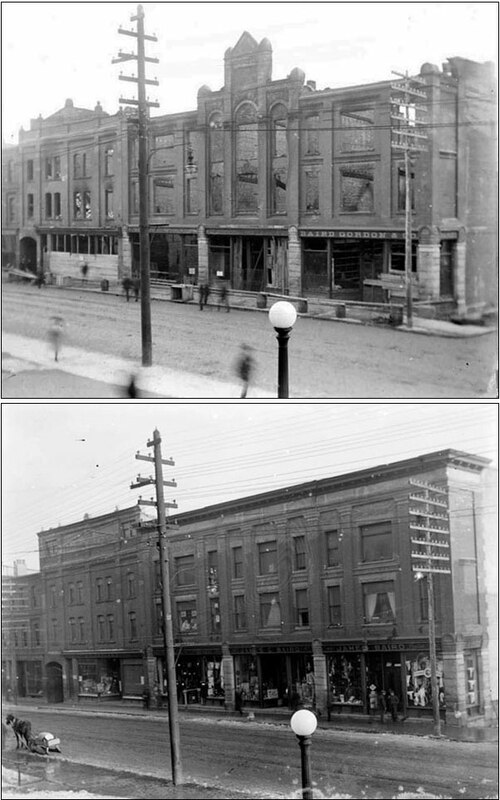 These two photographs show how the Baird Building on Water Street was reconstructed after the Great Fire of 1892. On the top is the burnt-out building in the immediate aftermath of the fire. On the bottom is the building as it was reconstructed after the fire. Note that the essential design was retained, although the turret has been removed, the roofline has been altered, and the peaked roof on the left of the building has been incorporated into a new, rectangular design. Many stone and brick commercial buildings survived the fire as shells, and were reconstructed using their old walls and foundations. Photos courtesy of the City of St. John's Archives (O'Mara collection, images 01-41-133 and 01-41-137). The buildings in the downtown commercial core of Water Street and Duckworth Street were rebuilt fairly rapidly, and were constructed of brick or stone in order to meet the fire codes established in the wake of the 1846 fire and strengthened after the 1892 fire (see the Reconstruction article). While some were built almost completely of stone or brick, others were wood-framed with stone or brick facing. Many of the brick and stone facades were simply designed, often with decorative touches around the windows or eaves. These four houses on Gower Street between British Square and Flavin Street are simple, flat-roofed designs with minor Southcott-inspired decorations. While many of the commercial and religious properties were designed with form in mind as well as function, it is important to remember that much downtown commercial property was working space that had little need of eye-catching design. The Crow's Nest Building is a good example of a simply designed commercial building. Built of red brick with simple window openings (although some decorative brick work along the eaves), this was originally built as a warehouse soon after 1892. It now houses offices and the Crow's Nest club. In the period immediately following the fire and into the first decades of the 20th century, it was still relatively common for stores and workshops to incorporate living spaces in their upper floors or elsewhere on the premises. This practice began to die out in the first half of the 1900s, and living and working spaces became increasingly separated. The S. O. Steele building (see above), for example, contained residential space on its top two floors until 1935, when they were converted to offices. Note that this roughly coincides with an increase in factories in St. John's, which are by definition working spaces only, and immediately precedes the creation of suburbs, which are primarily living spaces without working or commercial space, demonstrating that home and work were becoming increasingly separated in the early 20th century. Gower Street United Church was rebuilt on its old site in the late 1890s after it was destroyed in the Great Fire of 1892. The church originally had a 40-foot steeple, which has since been removed. 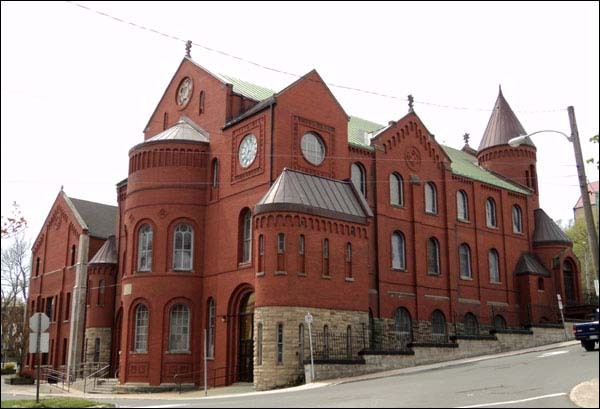 Many of the historic and distinctive churches in St. John's, including the Roman Catholic Basilica (then the Roman Catholic Cathedral; raised to Minor Basilica in 1955), St. Patrick's, George Street United, and St. Thomas' survived the Great Fire unscathed. Others, however, did not. The Anglican Cathedral was burnt-out, although the stone walls remained and it was rebuilt close to its original design. St. Andrews' Presbyterian, or 'The Kirk' was completely destroyed. It was rebuilt in a new location in the Gothic style that had become common in church construction in Newfoundland in the decades before the fire. Note that the Kirk and the new Masonic Temple were both constructed of Accrington brick, made in Accrington, England and known for its strength and rich red colour. Gower Street United Church (then Gower Street Methodist Church) was also completely destroyed in 1892. After overcoming financial difficulties and disagreements regarding design, the Gower Street Church was rebuilt on its old site in a Romanesque style, although the present structure, built in the late 1890s, has been modified from its original appearance, notably by the removal of a 40-foot steeple. 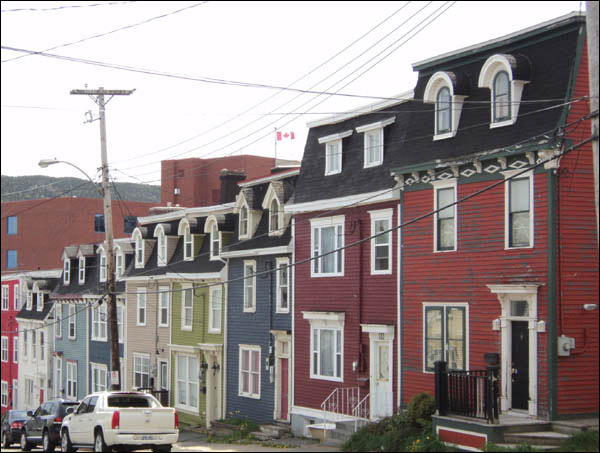 The 50-year period after the 1892 Great Fire saw many changes and developments in the city of St. John's. The bulk of the city's downtown core dates from this time period, and its architectural heritage comprises a major part of the city's unique appearance and identity. This is also the period that saw great technological changes, such as streetcars, widespread use of electricity, and the completion of the Newfoundland Railway that would influence the appearance of the city. The Second World War and the great technological, political, and economic changes that accompanied it initiated the process of creating the city as it exists today. But the city's downtown core owes its existence and appearance to the designers and builders who rebuilt the city in the wake of the Great Fire of 1892.